December 5, 2013 by fmgarchitects. The history of the Marino estate in Dublin is of interest being the first inter-war housing development in Ireland to be influenced by the then new “garden suburbs” ideas encapsulated in the Tudor Walters Report in the UK and it’s Irish counterpart, PC Cowan’s 1918 Report on Dublin Housing. This article looks at the design influences that shaped the Marino estate – for more reading on the history and background to the estate, see the reference books below. The garden suburb ideas which were developing among architects at the time proposed large formally-planned suburban estates at moderate densities (typically 12 houses per acre), with substantial areas of open space in contrast to the formal Victorian streets that had served as a development model up to them. The historical evolution of the Marino layout is summarised in the maps above which illustrate the site before and after it’s development and the early schemes of the design in development by the architects. Marino was heavily influenced by the early garden suburb estates in England. 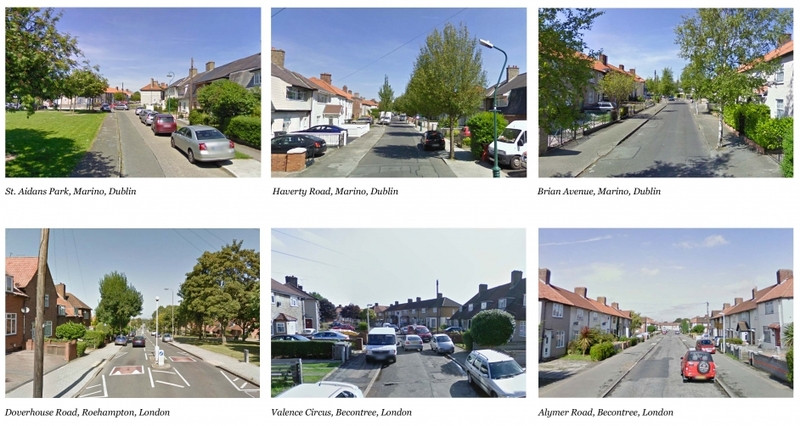 The similarities to estates at Roehampton (now called Doverhouse Road estate) and Becontree in London are particularly striking as illustrated below. 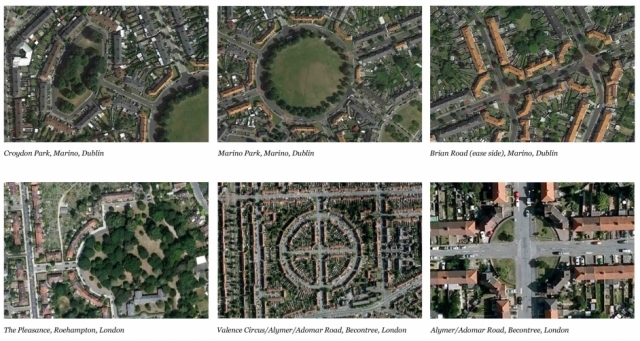 The geometric open spaces, crescents, stepped terraces of 4-8 houses, and canted blocks that highlight crossroad nodes in the London schemes (bottom row) were adopted in the Marino layout (top row). The “celtic cross” symbol is sometimes cited as an influence on the Marino layout, however it can be seen that the motif was already used in Becontree. The use of radial layouts in the London schemes apparently causes as much confusion as it does in Dublin today! The Marino house designs also adapted similar forms and materials to their London counterparts. The houses and sites are of similar dimensions and laid out with front & rear gardens which was an innovation at the time. Two-storey houses feature red terracotta roof tiles or slate finish in both instances with a mixture of brick or render finishes. The dormer mansard-style houses which are associated with Marino also feature in London although with a straight roof profile. 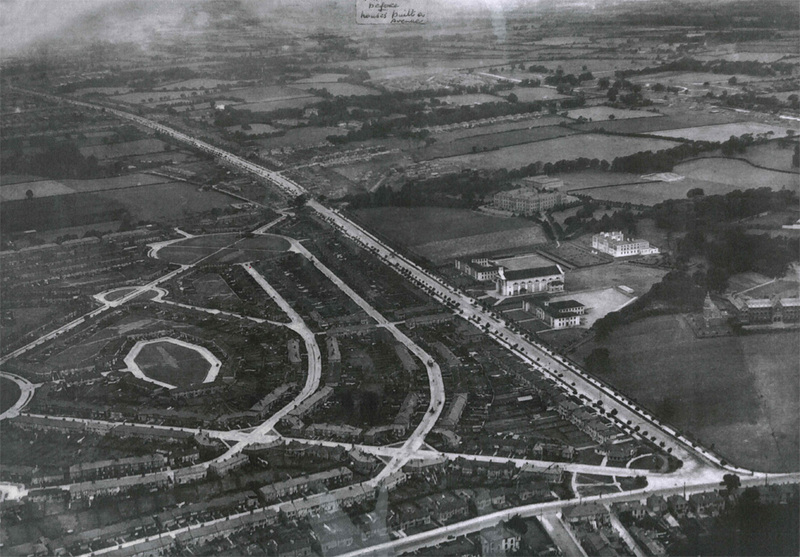 I watched something on ‘memes’ and ‘temes’ on TED Talks last night and you can clearly see the Garden City meme taking flight in the 20s as seen in Marino, Dublin. The garden city concept was different to the garden suburb model. Ebeneezer Howard who originally proposed the garden city model did not support suburbanisation – he saw his model of self-contained satellite communities as the solution to it. Thanks Brendan. They’re a key part of the character of these building and it’s important that the methods of construction are conserved where possible.